1. Preheat the oven to 200°C/180°C fan/Gas 6. You will need a shallow 2-litre (3½-pint) shallow baking dish. Place the squash and onions in a roasting tin, mix with the oil, season then roast for about 30 minutes until tender. (When you pierce the squash with a knife it should go through easily, but you don’t want the squash to be mushy.) Add the mushrooms for the last 10 minutes. 2. Put the spinach in a colander in the sink, and pour over a kettle of boiling water until the spinach has wilted. Allow to drain, then press out as much of the water as you can. 3. For the tomato sauce, mix the tomato passata with the pesto. 4. Immerse the lasagne sheets in boiling water for 5 minutes until softened. 5. For the cheese sauce, melt the butter in a small pan then beat in the flour. Gradually whisk in the hot milk, stirring all the time, until the sauce thickens. Add the mustard and about three quarters of the cheese and continue to stir gently until the cheese has melted. Season well. 6. 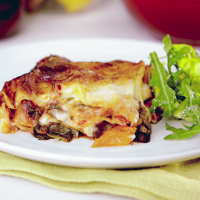 To assemble the lasagne, put a third of the roasted vegetables into the bottom of your ovenproof dish followed by a layer of spinach then a third of the tomato sauce and a third of the cheese sauce. Lay lasagne sheets on top of this. Top with half of the remaining vegetables, tomato sauce and cheese sauce. Add the last lasagne sheets and top with the remaining vegetables, tomato sauce and cheese sauce. Sprinkle the reserved cheese over the top. 7. Bake for 30–40 minutes or until the lasagne is golden and bubbling on top.